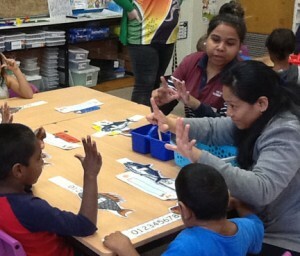 Year 11 and 12 students in the YES Centre have been visiting primary schools and helping teach younger students their number bonds as part of the Tentastic program, from Adelaide University. The students have brainstormed and come up with some of their own activities to help teach the primary school students basic numeracy skills. Sakara helping students at Carlton School.